The event could not have been scheduled at a better time for Tacoma. Tacoma is now considering "design review" for the mixed use centers and has hired consultants to make the "downtown more vibrant." The city is also working to retain Russell in Tacoma. The city is at some major decision points. 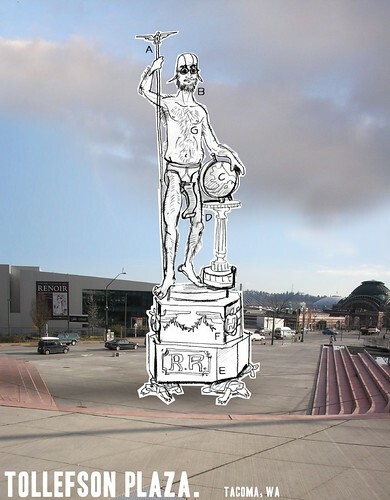 Kunstler can hopefully shake things up a little in Tacoma in a manner another city paid consultant, who is likely looking for more work in the future, simply cannot. The City needs alot of help in urban design in both the prioritizing of making livable and walkable neighborhood centers and downtown and in the techniques of how to do so. With few exceptions, Tacoma's land use codes subordinates all other values Tacomans have to one of the storing and moving as many cars as possible. First, it created a large cement dead zone in the midde of the city. A failure by any measure. I won't rehash it here. Second, and perhaps more troubling, the bad result obtained is still not recognized as a failure. Thus, Tacoma has not only lost much of the skill to make a city function but also lost even the ability to identify and distinguish what a failure and a success look like, making it diffucult for the city to improve next time. This idiotic exercise in civic mis-design is called a "green space." The Saratoga City Council strong-armed the property owner into scraping off a strip of parking lot in order to put this in. It's supposed to be a "solution" to a particular problem of poor civic design -- i.e., the fact that there is no building on this important downtown site. What has been delivered is a cartoon of a park. If you ask for an abstraction, you'll get an abstraction. Yet, Tacoma keeps making meaningless open spaces in the city over and over again believing that it accomplishing something beneficial. Another prominent example was Frost Park on 9th and Commerce, a green strip with dead areas around it, it has been a crime magnet. 1.American cities need more open space. "We haven't been building towns in America," Kunstler says. "We've been building UFO landing strips." Consider the desolate appearance of vacant lots and meaningless strips of lawn. European villages and older American small towns convey a sense of security because buildings and trees form a comforting street wall. But in America, many urban areas have too much open space, and too much space that is poorly defined, Kunstler says. But who knows, Perhaps Kunstler will marvel at Tollefson Plaza. I am buying my ticket(s) early. For sponsorship opportunities, Contact Paul Sparks, Local Life Tacoma (253) 569-9413.
by NineInchNachos on 2/21/2008 @ 9:04am cool flyer BTW. Looking forward to the Veritas gatherings..
Having a HFW statute there would at least prevent the area from being uses as a UFO landing strip. Looking forward to the Veritas gatherings..
Me too. Looks like a fun panel. News to me. I think was before Kunstler hit the big time. by NineInchNachos on 2/21/2008 @ 5:52pm the one with all the triangles and waterfalls and flotilla of trash? by Erik on 2/21/2008 @ 6:42pm the one with all the triangles and waterfalls and flotilla of trash? Yes. I think so. One of the problems we have with Commerce is .... well.. there's very little commerce on it. by NineInchNachos on 2/21/2008 @ 8:16pm taxable commerce you mean. James Howard Kunstler to speak in Tacoma on April 23rd. TACOMA, Wash. â€“ March 31, 2008 â€“ Local Life Tacoma and Exit133 have partnered to bring James Howard Kunstler, urban planning advocate, social critic, journalist and novelist, to Tacoma on April 23, 7:00pm, at the Broadway Center for the Performing Arts' Theatre on the Square. This event is sponsored by Veritas Mortgage, Embellish Salon, the University of Washington Tacoma Urban Studies Department, Boe Architects, the University of Puget Sound Politics Government Department, BCRA, and The Broadway Center for the Performing Arts. Student ticket prices are made possible through the generous support of the City of Tacoma. James Howard Kunstler is the author of seven novels and countless articles and essays including The Geography of Nowhere and The Long Emergency. Geography earned much attention and praise, launching him into the spotlight as a commentator on America's hapless urban planning. Mr. Kunstler has lectured extensively about urban design, energy issues and new economies for The TED Conference, Google, American Institute of Architects, the National Trust for Historic Preservation, the International Council of Shopping Centers, The National Association of Science and Technology and other professional organizations as well as at numerous colleges and universities. Mr. Kunstler aptly describes his lectures as "stand-up comedy with some dark moments." His audience knows he is dependably acerbic, witty, well-read and exceedingly alert, drawing from a tremendous store of hard facts and idealism that ends on a good note: Well-earned and reasoned hope. by Erik on 3/31/2008 @ 12:49pm I just called Broadway Center. The tickets are $18 a piece. The box office is open 11-6. They indicated that they have the tickets now. I will pick up a couple today given the press Kunstler has been getting. by PaulSparks on 3/31/2008 @ 5:55pm Student ticket prices are also available. by Erik on 3/31/2008 @ 6:11pm Student ticket prices are also available. Nice. What is the student price? by jenyum on 3/31/2008 @ 9:10pm What will you barter for? by KevinFreitas on 3/31/2008 @ 9:20pm You should have some kind of urban development related contest and give one away. 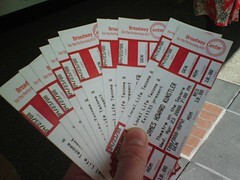 Or just scalp 'em -- maybe to some displaced hip hop lovers that need a way in to the Broadway Center. by NineInchNachos on 3/31/2008 @ 9:29pm this is a good deal, the groucho tickets were expensive in comparison! I still haven't got mine yet. I will likely be producing 'courtroom' style sketches in the audience, since film and audio will be forbidden. by Erik on 3/31/2008 @ 9:38pm Or just scalp 'em -- maybe to some displaced hip hop lovers that need a way in to the Broadway Center. I have considered implementing a beautiful angle type rarity pricing scheme and scalping them off. You should have some kind of urban development related contest and give one away. That's a good idea. I could have a contest online with a pre-selected date and time of the Kunstler trivia question. RR I know would be a fierce competitor as he has watched and read just about everything Kunstler. by NineInchNachos on 3/31/2008 @ 9:56pm I just listened to all his podcasts today. Good stuff.